We Apparently Love Us Some Zombies! Sunday’s third season premiere of AMC’s The Walking Dead delivered record ratings again for AMC, attracting 10.9 million total viewers, an increase of 50% over last season’s premiere. The zombie drama also drew 7.3 million in the adults 18-49 demographic, up 52% over last year. 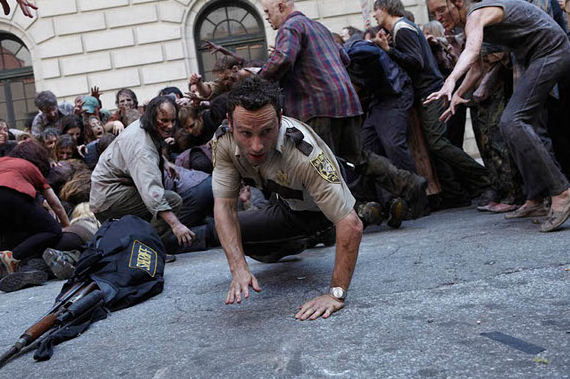 Walking Dead also improved 46% in adults 25-54 (6.1 million). The 7.4 HH rating was up 54% over last year’s premiere as well. Overall, Sunday’s episode grossed 15.2 million total viewers, 10.3 million 18-49 and 8.6 million 25-54, through three airings.